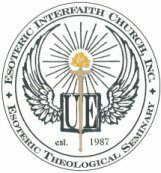 The Esoteric Theological Seminary offers religious Bachelors and Masters degrees in Theology, Religious Studies, Divinity, Ministry, and Metaphysics. You may earn a Bachelor of Science or Bachelor of Arts in the above disciplines, such as the popular B.A.R.S. degree (Bachelor of Arts in Religious Studies) or you may obtain your Master of Science or Master of Arts. The Seminary also confers traditional ecclesiastic degrees such as Bachelor of Theology (B.Th.) Master of Theology (M.Th. ), Master of Divinity (M.Div.) with no “Arts” or “Science” designation. Research and decide which degree is best suited to you and your current work in the field. We will consider all religious degree titles if you are in need of a different style degree. (i.e. Bachelor of Science in Islamic Studies, Master of Christian Ministry, etc.) Just email what degree title you have in mind and we will tell you whether the Seminary can confer it. Generally the rule is any religious degree with a clear religious modifier in the title is acceptable. 3. Write and submit your spiritual biography. The spiritual history or biography tells the story of religion and spirituality (they are different!) in your life from childhood to present. 4. Write a detailed summary of the work you do in the field of religion, spirituality or metaphysics and tell how earning this degree will assist you in your ministry or and /or religious-educational goals. 7. Write a 2000 word research paper or essay on the religious or spiritual topic of your choice. Or for Masters degree, write a 3000 word Masters Thesis on any spiritual topic of your choice. Submit by email or snail mail to the address in #5 above. Half the Tuition paid toward your Bachelors or Masters degree may in future be applied toward the tuition fee for one of the Seminary’s Doctorate Degree programs or Ph.D. program. The Master of Divinity degree is ideal for active ministers working in the field with congregations or circles of people. Focus is on religious and theological studies. A Bachelor’s Degree in any subject, or one earned from this Seminary is required before enrolling in this degree program. Master of Sacred Theology (S.T.M.) Bachelor level is called the S.T.B. The Master of Sacred Theology degree is for ministers who wish to emphasize theology, religious history and apologetics. This program consists of writing a Master’s thesis in the candidate’s chosen field of study. The Master of Philosophy degree is for ministers who wish to emphasize Western Spirituality, Philosophy and Spiritual / Religious Thought. This program consists of writing a Master’s thesis in the candidate’s chosen field of study. Master of Theology (Th.M. or M.Th.) Bachelor degree is B.Th. or Th.B. The Master of Theology is an alternative degree to the Doctor of Theology. This degree is conferred upon candidates that complete all the Th.D. degree courses but would rather not write the dissertation. Thus, there is no dissertation requirement for this degree program. Entrance to this program requires a student to take all courses leading to the Doctor of Theology degree. Candidates should be familiar with the theology of their chosen religion, its scripture, lore, doctrines, as well as be able to defend it, also known as apologetics.